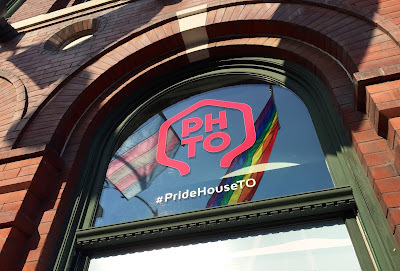 For the last few days I've been volunteering at PrideHouseTO, which operates out of Toronto's 519 Church Street Community Centre, during the run of the 2015 Pan Am Games. The PrideHouse movement began with the 2010 Winter Olympic Games in Vancouver, when Pride organizers in Whistler thought international visitors might enjoy their local festivities. The idea took off, and every multi-sport international games since has hosted a PrideHouse, with the notable exception of the 2014 Winter Olympic Games in Sochi. My normal shift involves either photographing or live-tweeting events at the pavilion. Today, one of the volunteer managers asked me if I'd like to take in an event called #HUDDLE2015, at Isabel Bader Theatre, which included pairs figure skater Eric Radford and former collegiate track athlete and VP of You Can Play, Anna Aagenes. 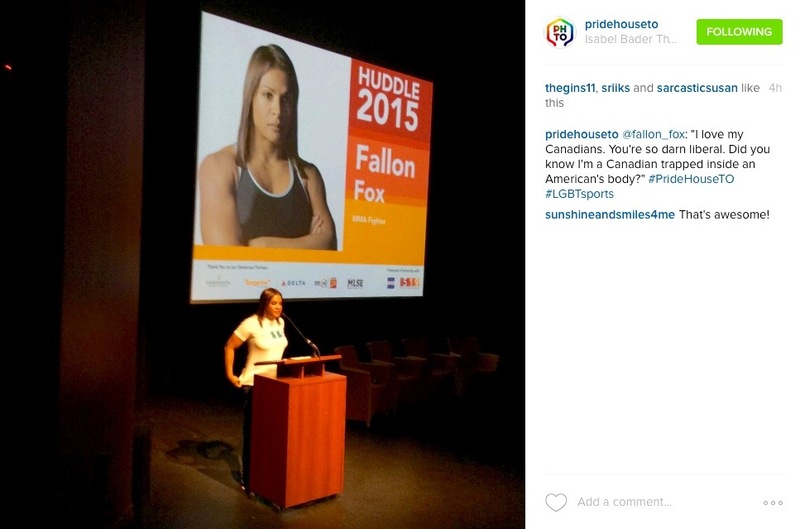 Headlining the event mixed martial arts competitor Fallon Fox was there, the first out Trans* fighter in the sport. Until tonight, I hadn't thoroughly considered the implications of being LGBT -- and out -- in organized sport. Nor had I considered thoroughly the impact homophobia had on my own attitude about sports. I pretty much gave up on organized athletics more than forty years ago in middle school. It wasn't just vulgar taunts occasionally thrown my way when I underperformed on the hockey rink or football field; it was the unending din of sexism and homophobia and racsim and bravado that permeated the culture of the locker room. And it took me a few years past high school to re-engage with sports; other than things I could do independently, like swimming, cycling, working out. 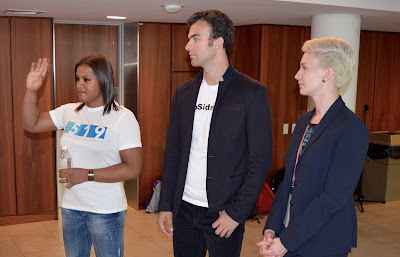 Fallon Fox, Eric Radford and Anna Aagenes. And so tonight, it was an unexpected treat to hear these three accomplished LGBT athletes share a bit of their stories. It made me think about dedicated athletes who work through this unnecessary adversity. And those who give up. First to take the stage was Anna Aagenes, a spokesperson for You Can Play, which promotes inclusion in sport. Building on the theme of the gathering, she wondered aloud what an athletic season might have looked like for her as a young collegiate athlete if the coach called a huddle at the start and said, "This place is inclusive." There was a trace of exasperation in Eric Bradford's voice when he recounted a competition in which a Russian competitor cracked, "Are all Canadian figure skaters gay?" Bradford described the uncomfortable silence when he later went into the locker room -- teammates embarrassed and perhaps offended by the remark but not knowing what to say. He also talked about something I could relate to very personally -- that conversation you have in your head with the bullies later in life after you've achieved. I thought about my own fourth-place finish in my division at the 2000 Ontario Open Karate Championships. Which is to say, fourth place, men's division, green-to-brown-belt, ages thirty-five to forty-one. But hey. 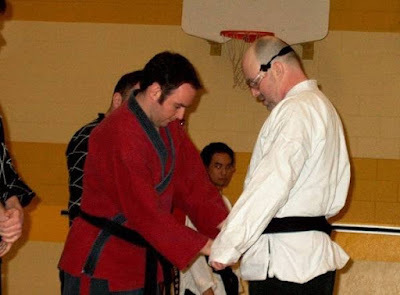 I thought about the day in 2006 when I graded for my black belt in Hapkido and Shotokan Karate -- at the age of forty-five. Or the fact that I've taught health and physical education for much of my career as an elementary teacher. Mr Bradford pointed out that sports facilities typically display a code of conduct or a code of behaviour. What if that code said something about inclusion? Something as simple as a little rainbow flag on display? Like her fellow speakers, Fallon Fox's presentation began with a short video -- in this case, a trailer from her documentary Game Face. If you haven't seen the film, or don't know about Ms Fox's remarkable career as a athlete, the trailer provides a glimpse of the hateful slurs and accusations the US Navy veteran has faced as MMA's first openly transgender fighter, as well as the omnipresent pushback she receives in some media and from some fight fans. 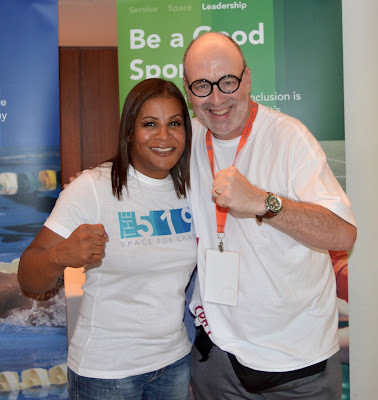 But what was very encouraging to hear were Ms Fox's recollections of cisgender women martial artists who embraced and supported her when she decided to resume her recreational athletic career, and train in Brazilian Ju Jitsu. And so the challenge I issue to myself when I return to school in the fall, and meetings of our school's Gay Straight Alliance resume, is to look at what we're doing to make all activities inclusive and safe. MMA fighter Fallon Fox and yours truly.